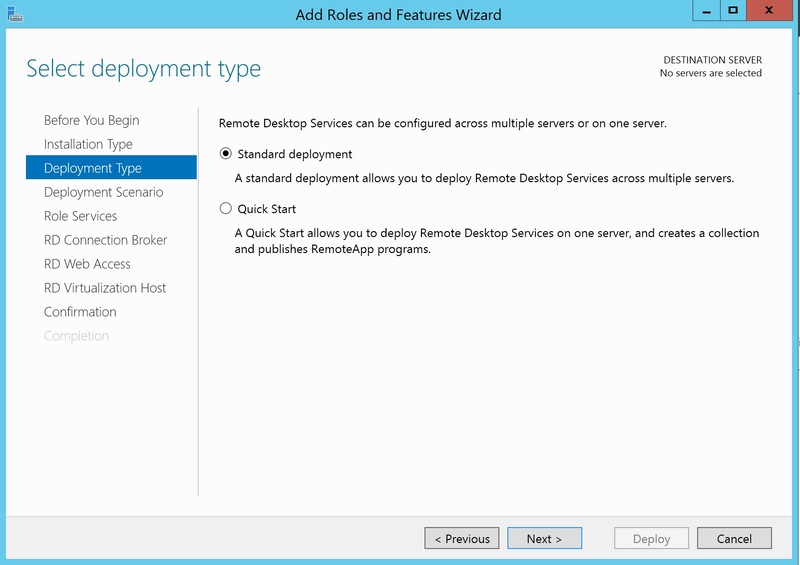 This blog post will show you how to deploy RDS on a Domain Controller, I have received a lot of messages over the past months on this saying that it’s not possible. 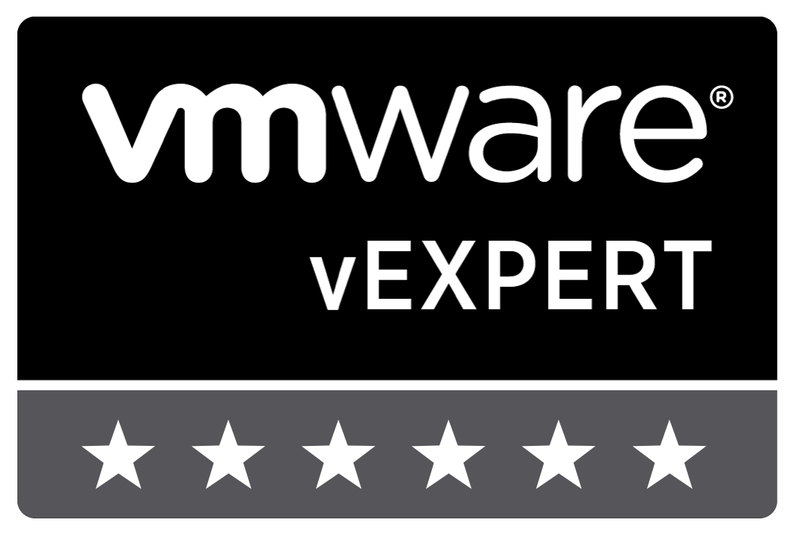 Firstly I would personally never recommend deploying RDS on a domain controller as there are a number of security risks and best practices that get thrown out of the window. 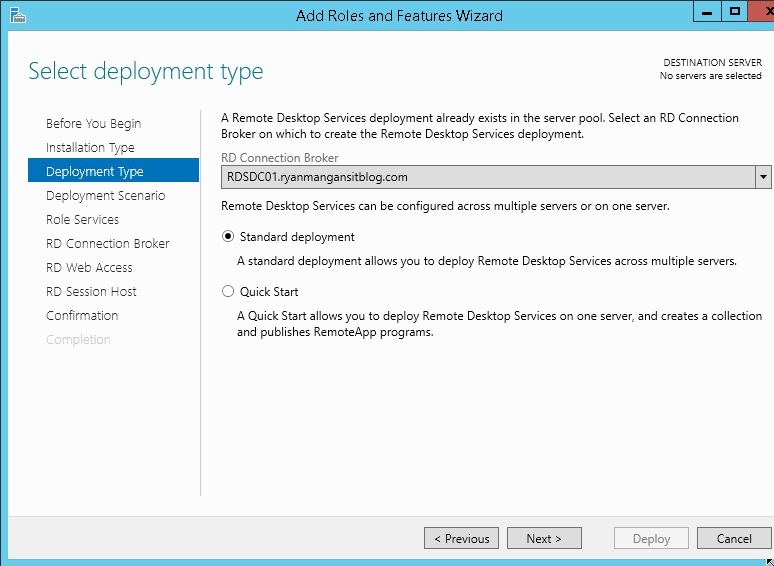 Go to Server Manager Select Add roles and Features, then select Remote Desktop Services Installation. 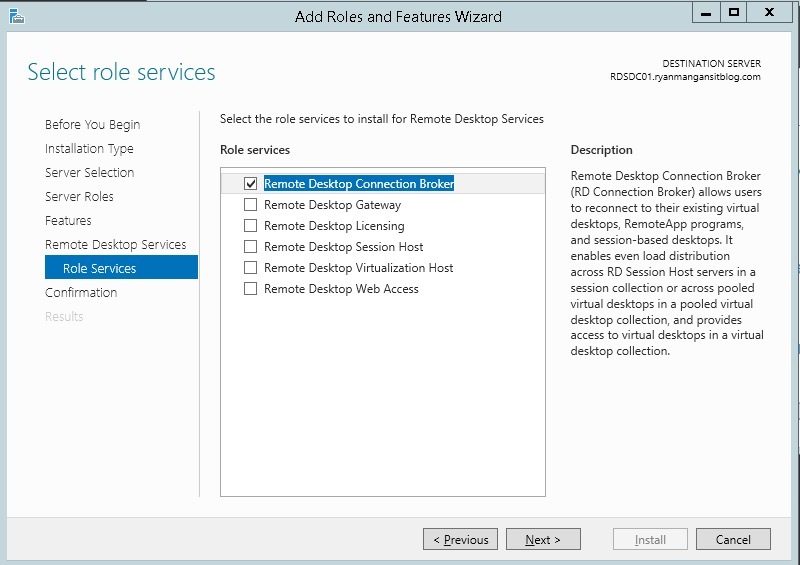 Select the Domain Controller for all services, RD Connection Broker, RD Web Access, and RD Session Host. Once you have confirmed and selected Restart. 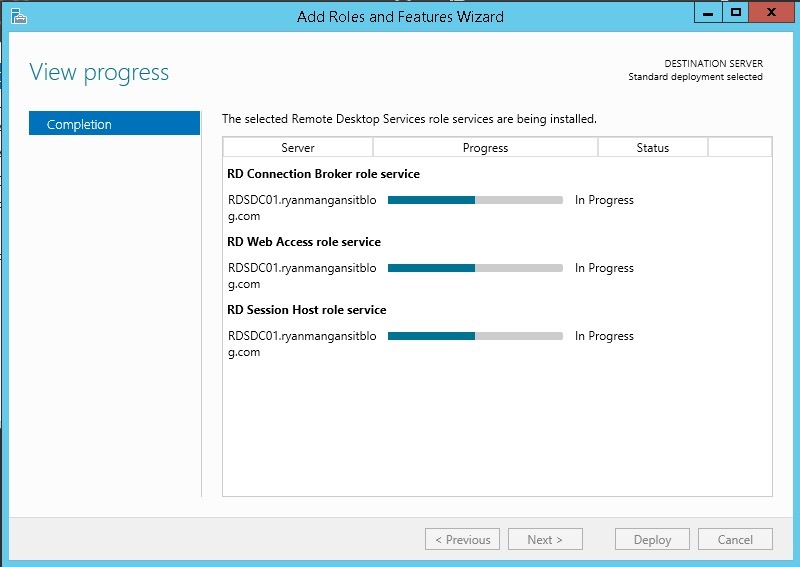 RDS will then start to install. The installation will Fail………… But wait don’t panic, everything still works !!! I will explain. The Connection Broker installs, but the RD Web and Session Host fails. Running the install process again, will resolve the issue. Start the process again …. There you have it ….. 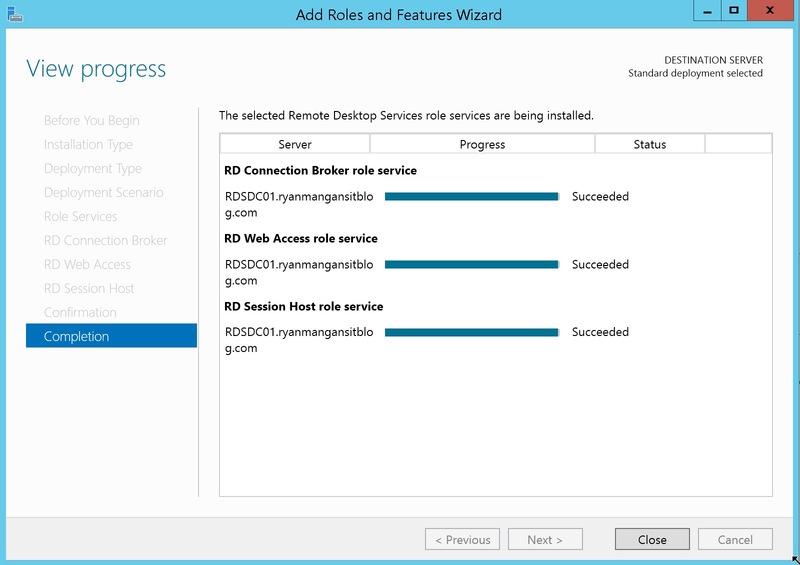 The Domain Controller now has the Connection Broker, Web Access and Session Host roles. 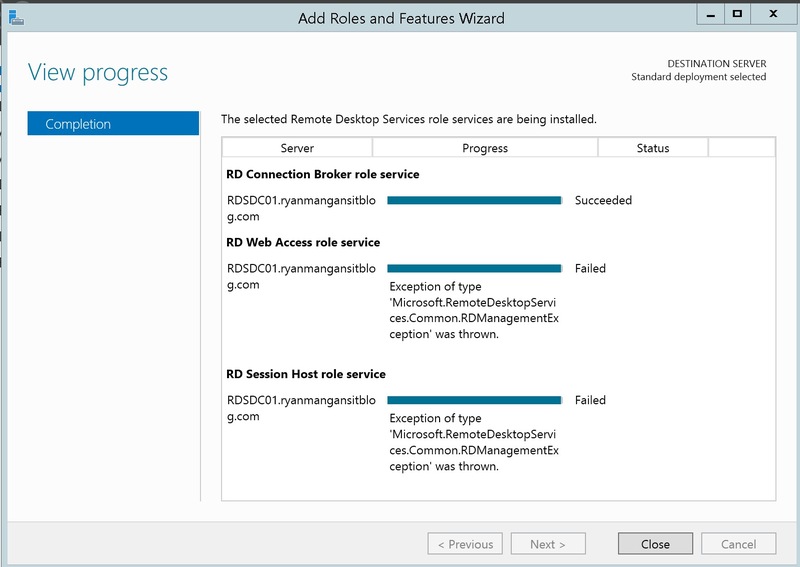 Install the RDCB role. 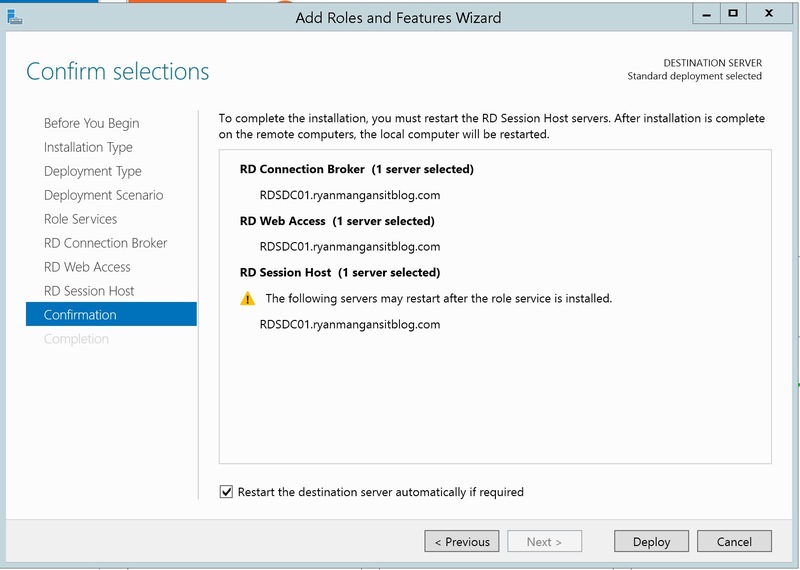 Then start a RDS installation and you will see the connection broker role present. Follow the same process as before..
As you can see the install will not fail. I hope this helps…. and answers everyone’s question ! 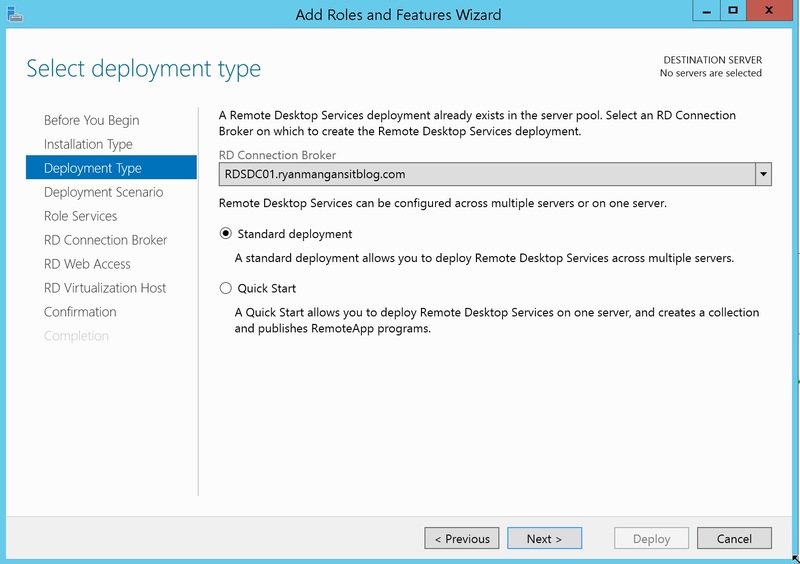 You can deploy RDS on a Domain Controller. Check your configuration, Build Version and follow the process provided. This method does work. 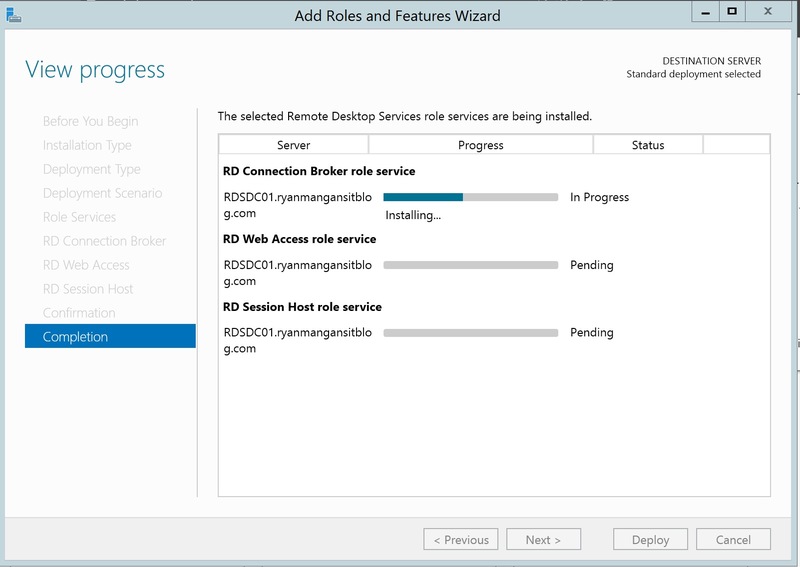 Reboots during the installation of the roles can resolve the issues you stated. Thank you, Ryan. What about RD Gateway? Can it be installed on a DC, and I guess, RD Licensing too? 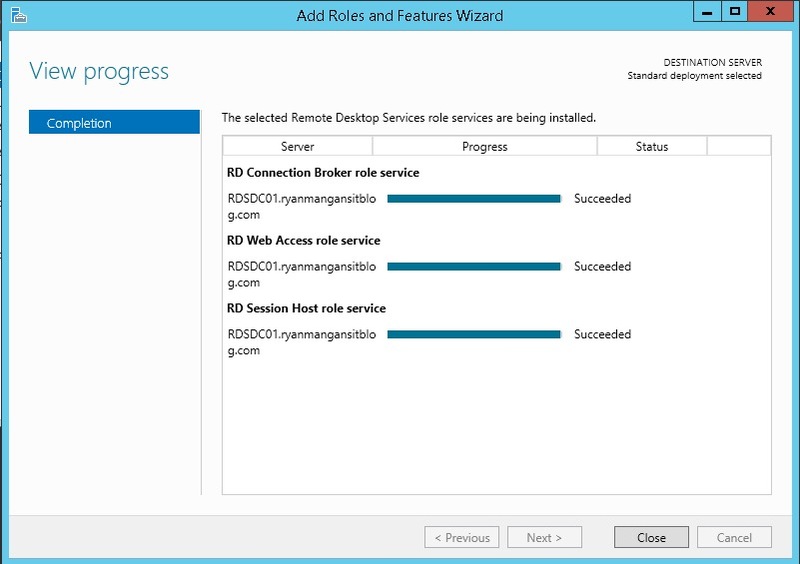 How’s that when you install the RDS services and after restart the server, you cannot access again using MSTSC? this sounds like a licensing issue, or a certificate issue. you need to review the event logs. if you have installed a certificate for RDP and its incorrect, then it can break remote access to the server. I see that it’s possible to setup everything RDS on a single box. I know it’s not recommended, but when setting up the domain for this server should I use the same domain as their FQDN or a subdomain? (IE Contoso.com or AD.contoso.com) The purchased certificate will likely be applied to remote.contoso.com for IIS. Thank you for your Article.. 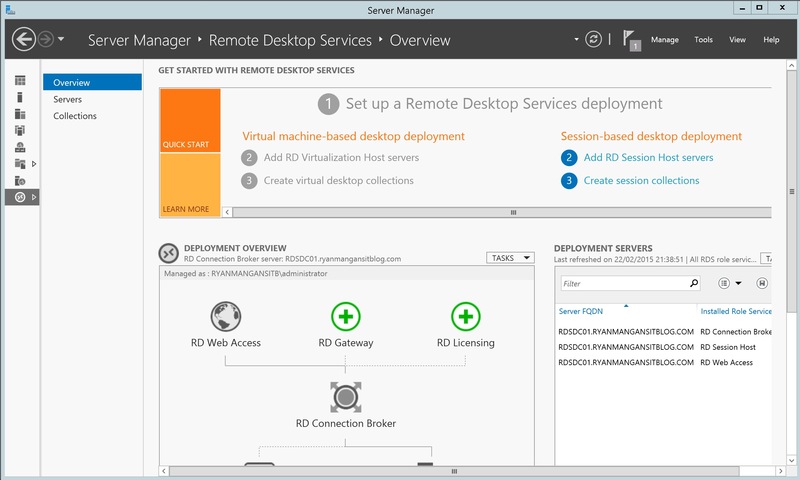 I had some questions about a setup I’m trying to build out..
i”m looking to create a Multi Tennant RDS Environment to host RD Sessions for 3 different customers. i’m trying to keep our start cost low and have Provisioned 2 Server. Server A and Server B.
Server A :would be our PDC and we would create an OU for each customer. The items I can’t wrap my head around would be the following. 1. 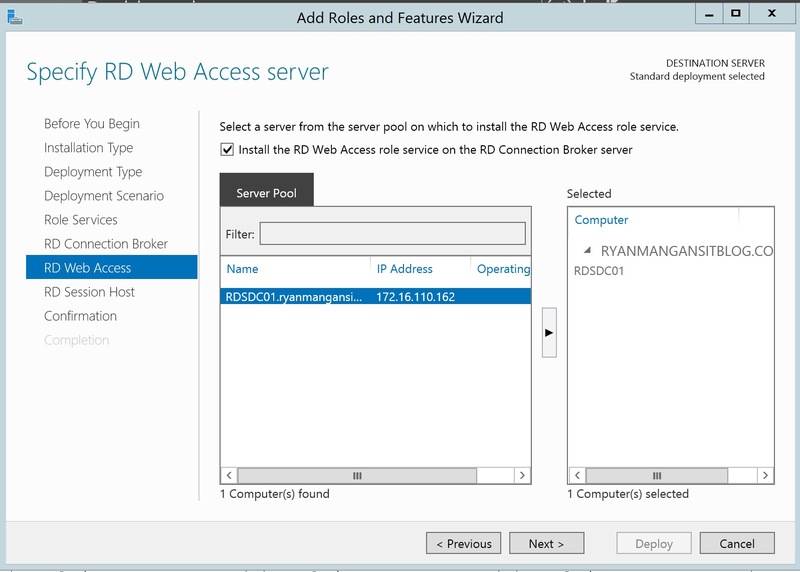 Can I Run the Following Services from our PDC – “Server A” RD Web Access, RD Licensing,RD Gateway and RD Connection Broker? 2. I’m Confused between how the RD Gateway and RD Connection Broker would help me out. I’m not going to be doing any Load balancing or running a Server Farm. 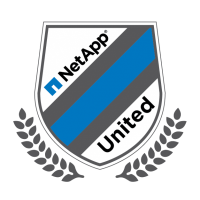 My Goal would be to Spin up a dedicatd RDS for each Customer as we onboard them. Could this be just accomplished with the RD Gateway and statically assigning an Organizational Unit to only connect to RDS Server X.
I would avoid using a DC for an RDS deployment. They are fine for labs but not for production. the RD Gateway allows access externally using TLS and SSL (VPN) like connectivity and the connection broker manages reconnects etc. Thanks for this article….have fought this battle once before, gave up and wiped the server with a fresh reload. Made my day. I’ve tried your suggestions and they just keep failing. 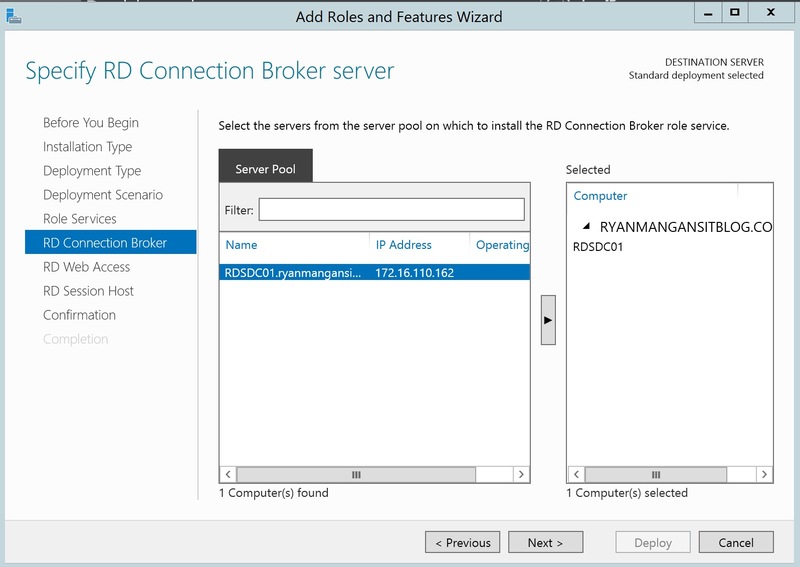 I never get to where it says fqdn as connection name for rd broker. The 2nd way you suggest doesn’t come up either. any ideas? I’d be so grateful. Stuck on this and I’m running out of time. you need to ensure that all the hotfixes are applied and the server is patched up to date. All updates are installed. The hotfixes that I’ve found say they’re not applicable to the server. I don’t know what else to do. Any ideas?